Professor Blanton specializes in early American history, with a focus on the legal and political history of slavery and antislavery from the colonial era through the Civil War. Additional research interests include the history of American capitalist development, early modern English history, the politics of interracial radical abolitionism, and the history of New York State. Blanton’s primary research project examines the development of Anglo-American slave law in the early British Empire, with a focus on the ways in which enslaved people and their allies pushed for the recognition of slaves as subjects of the crown in England, Massachusetts, and Virginia. His work illustrates that a concerted legal challenge to slavery existed in the Anglophone world well before the mid-18th century imperial crisis brought forth an organized abolitionist movement. He is revising his book manuscript, English Air: The Law of Slavery and Subjecthood in Early Anglo-America, for publication. 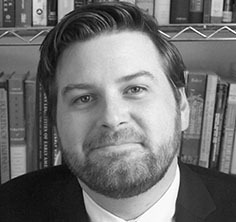 Blanton is also working on a number of other projects, including the use of Digital Humanities methodologies to examine late-18th century legal texts and an article examining how mid-18th century changes in international law influenced the process of military emancipation during the American Revolution.